What is a developmental play group? structured play opportunities for kids. activities related to a playful theme. Who are the play groups for? Our play groups are designed as positive play experiences for ALL children. 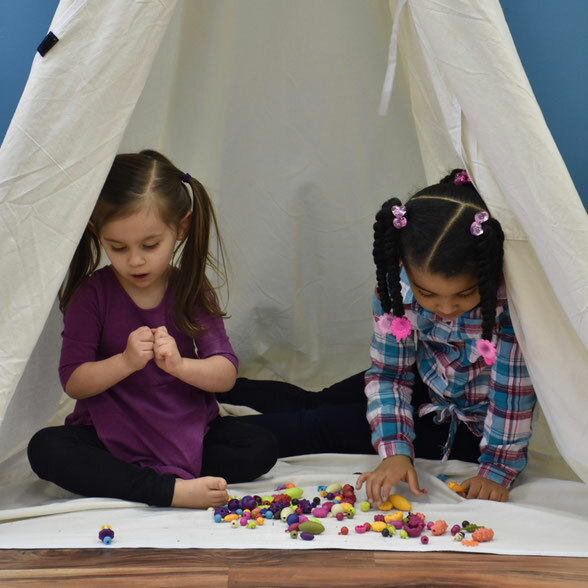 Every child can benefit from the fun and creative movement, sensory, and fine motor activities we provide. If you have a child who has special needs, please get in touch with us and we will discuss how we can provide a play experience that is right for him or her! Are the groups really free? Yes! We want every child to have access to our space and the positive developmental experiences we provide. Kids will be able to come to one play group per week for FREE. If families wish to sign their child up for more than one group per week, we have punch cards available for purchase. You can buy a punch card at The Treehouse for $25/5 classes with cash or check made payable to The Treehouse Ohio. We rely on contributions from individuals and corporations as well as grant funding to be able to offer our services at low or no cost to families. When you sign up for your first play group, our system will ask for your credit card information. Credit cards will NOT be charged for regular play group attendance. Not showing up for your scheduled play group OR cancelling less than 24 hours before your scheduled play group will result in a $5.00 charge. Do I have to stay with my child during play groups? Nope! In fact, we find that kids participate more freely and groups run more smoothly when there are fewer adults in the room. We ask parents to drop their children off for play groups with a quick hug and 'goodbye' so we can begin on time! We do NOT provide pediatric occupational, physical, or speech therapy. Our groups are not intended as a replacement for therapy, but can definitely give kids an added boost with skills like handwriting, attention, motor development, and sensory processing. Why do I have to sign a release? We require the parents of all children who attend our play groups and other events to sign a waiver and release. The release form gives us permission to use photos of the children in our play groups on our blog (The Inspired Treehouse) and on all social media platforms. We are pediatric physical and occupational therapists, which means that we have specialized training in child development. Our training and education as therapists allows us to hone in on the skills that ALL kids need to succeed in the classroom, at home, and beyond!